I’m back in San Francisco where I can walk my dog in the morning and drive my kid to school. I actually went shopping to buy some of that fresh California produce I missed so much when I was in DC — perhaps I was just shopping at the wrong places. This particular beet tempted me from the organic vegetables section of the supermarket. I’m learning PhotoShop (again). I want to be competent with a wide range of tools — not just code. 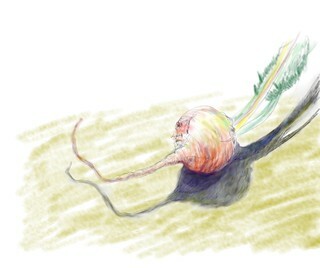 I indulged in the purchase of a pressure-sensitive tablet and experimented with the so-called pencils. I’m collecting tutorials and tools through my learning path. I was inspired by the Lindsay Norman collection: Web Design for Beginners.